Purpose: To investigate N-succinyl chitosan nanoparticles (NSC NPs) encapsulation with Dunaliella bardawil (D. bardawil) biomass for high utilization enhanced effectiveness and least side effects for anticancer activity. Methods: The potential bioactive compounds from D. bardawil biomass were encapsulated NSC NPs by ionotropic gelation method and to characterize its molecular shape, particle size, stability and polydispersity index using FTIR, XRD, SEM, TEM and Zetasize Nano analyzer. 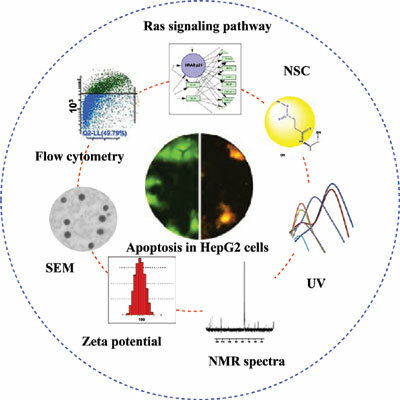 Signaling pathway analysis, molecular docking study and in vitro anticancer screening were performed on chosen H-Ras P21, 721P and liver cancer cell lines (HepG2), respectively. Results: The D. bardawil biomass majorly contains 6 bioactive compounds such as β-carotene, lutein, zeaxanthin, phytoene, canthaxanthin, and phytofluene were identified by LC-MS. The D. bardawil biomass encapsulated NSC NPs showed an average particle size of 80±5.6 nm in spherical shape, crystalline nature, zeta potential of -32±2.7 mV and polydispersity index of 0.51±0.02. Interestingly, the identified target using graph theoretical signaling pathway analysis and molecular docking study showed strong interaction of NSC NPs in binding pockets of H-Ras P21 protooncogene. At 50μg/mL, NPs displayed 95.60% cytotoxicity in HepG2 cell line. The apoptotic cell cycle analysis showed cell death for 24 h and 48 h representing 13.13% and 47.04%, respectively. Conclusion: The highly cross-linked, biocompatible, biodegradable, nontoxic NSC NPs promising carrier for delivery of bioactive molecules present in the D. bardawil biomass was found to be actively involved in deregulation of cellular growth in targeted cancer cells. Thus active NPs serve as a novel nanodrug to enhance the controlled; site specific drug delivery in the management of cancer. Dunaliella bardawil, apoptosis, graph theory, cytotoxicity, H-Ras P21, N-succinyl.